I just wanted to check in and post an update on my test drive of the book Write a Novel in Ten Minutes A Day, as I prepare and write a novel in 3 months or 90 days. I am almost 1 month in and have mostly completed all my preparatory work including character work, setting building, and story and structure development. I am using the 10 Minute Method, as I really love it! It really works for me, my personality and fits in well with my daily life. I did struggle near the beginning with developing my initial idea, and I actually bounced around a little, trying different methods to develop my story plot and structure. I didn’t have much luck, however, so I came back to Grubb’s book, and continued working through her exercises and workshops, and I must say, I really like the way she helps you to develop your story. She helped unblock me several times and got me moving again. She has some excellent advice on trying out your story idea within different ‘plots’, such as comparing your idea within the Tragedy Plot Type versus the Quest Plot Type. THis really got me brainstorming and really helped my envision the novel. I have continued to try to maintain the 10 Minute Writing Method, and it actually works really well, with me typically writing for about 12 or 13 minutes and writing approximately 470 words. This is incredible for me. I know I haven’t officially started writing the novel yet, but I wanted to keep up my daily writing, so I’ve been writing to daily prompts, and each piece of works tends to result in something relating to the novel I’m working on; whether its character exploration or backstory, or just random scene ideas that pop into my head. Later on, I will decide whether or not these will actually go into my novel. I have been using the 10 Minute Method for other chores around the house too, and for writing and creating content for this website. I’ve found, that I can really be quite productive if I only I only have to clean for 10 minutes at a time. Like Grubb states, I’ve found myself rushing through the dishes and laundry in order to get back to writing, and other more fun ‘jobs’. Just yesterday I found a great channel on YouTube by Shaelin Bishop – called ShaelinWrites. She’s a young writer, in her early 20’s I believe, but she has completed a number of novels (over 10) and has a wealth of knowledge; she really does seem wise beyond her years. I found her while browsing through my Facebook writing groups, and someone mentioned her process of plotting her novels. She recommends a kind of brain dump of your story in long form, approximately 10-15 pages, then breaking up that long summary into your novel into chapters. Her outlining method is kind of a take on the snowflake method, with an expanded story outline in paragraph format. I like this, as I sometimes know a lot of the story, but it’s rolling around in my head and throughout my notes, so condensing it down into one place, then breaking it up seems like a great idea. I’ve always struggled with finalising my stories, so finding this method has really lightened things up for me. 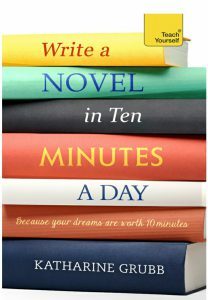 If you are interested in Grubb’s book, Write a Novel in Ten Minutes A Day you can purchase it below, from Amazon, or check back here later on, for my full in depth review. What are your thoughts on the 10 Minute Novel Method? How is your daily writing going? Please let me know in the comments below, and I will reply as soon as possible. Move Beyond Not Finishing: How to Finish Writing a Story!